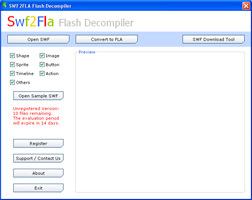 SWF2FLA Flash Decompiler allows you to convert SWF to FLA format to recover all images, sound, action scripts, texts, and morphs. All components in the movie can be completely recovered and action scripts can be turned into neat and readable code. You can also download SWF files from the Internet with the SWF catcher in the program. This software can be useful for Webmasters, Flash designers, or those who want a deeper understanding of Flash. Decompile SWF to FLA and extract SWF elements. Convert video to FLV/SWF easily. Qweas is providing links to SWF2FLA Flash Decompiler 3.1.2 as a courtesy, and makes no representations regarding SWF2FLA Flash Decompiler or any other applications or any information related thereto. Any questions, complaints or claims regarding this application SWF2FLA Flash Decompiler 3.1.2 must be directed to the appropriate software vendor. You may click the publisher link of SWF2FLA Flash Decompiler on the top of this page to get more details about the vendor.